I am thrilled to bits…. a lady on Ravelry found a link to Knitting Today archives. This means that people who are looking for patterns for Edward and Anastasia teddy bears (that I designed for Knitting Today) can now get the patterns online. I can’t send them out because the publisher owns the copyright. I did a LOT of designing for Knitting Today, so there are lotsa other patterns in there from me, too. 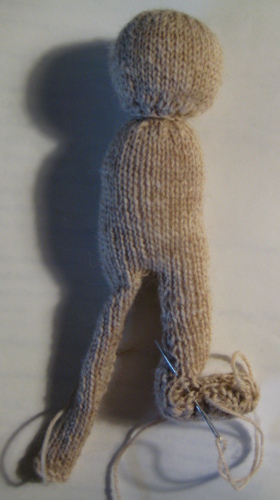 Here is Edward Bear with his head and one leg stuffed. His foot is turned up and the stitching is started along one side of the foot. 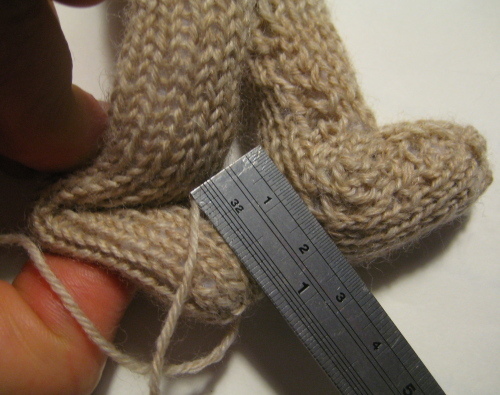 Here’s a closeup of measuring the foot- Stitch the edges together around the fold to stitch the foot to the leg- around the sides of the foot and across the top of the foot. Can Edward and Anastasia Bear be knitted with thicker yarn and larger needles? 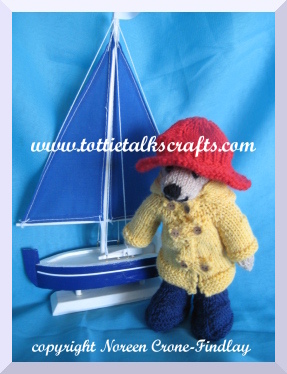 Edward and Anastasia Bear are 2 little bears that I have designed for ‘Your Knitting Life’ magazine (formerly known as ‘Knitting Today’), and they’ve been in each issue of the magazine since it started. They are small… they’re 6 inches tall, and are knitted on 2.75 mm needles using Regia sock yarn. Recently, on Ravelry, someone asked if Edward and Anastasia could be made larger, and the answer is, ‘You betcha’! The humungous Edward Bear in the photo is 18 inches tall. If you knit with 8 or 9 mm needles and super bulky yarn or 2 strands of medium weight yarn held together, you will get one very large Edward Bear! Stitch through the hips to make them bendable. The phone just rang, and it was my sister. She went grocery shopping and found ‘Knitting Today’ on the stand. She thought… hmmm… Isn’t this the magazine that has Noreen’s teddy bears? She was delighted to flip it open and find Edward Bear in his new raincoat, boots and hat. and showed her the photo of Edward looking spiffy in his raincoat. She reached over and plucked one of the copies out of Sis’s basket, and grinned. And, then she went off to see Mom. Well…. Mom fell madly in love with Edward Bear, so, guess what? 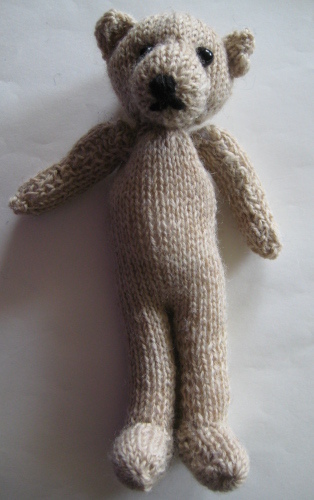 I need to knit an Edward Bear for our mother, and of course, one for my sister… and, oh yes, I promised one to my daughter, too…. Hmmm… I wonder if Sis would rather have an Anastasia Bear? 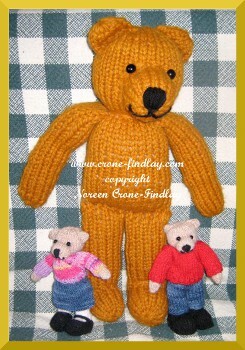 I need to stop everything and knit up some small, but wonderful bears for the women in my family. We all have a well developed sense of whimsy, and Edward and Anastasia definitely are all about delight. Off to grab my needles….